Jackpot Capital Casino has released 10 coupon codes that award with 30 free spins each! Redeem the coupon codes listed below to claim your free spins, but please remember that players are usually not allowed to use two free bonus codes in a row. The first code worked for me, but I do not know if the codes work for new players as well. Good luck! 50 Free Spins for New Players: Register a new Jackpot Capital Casino account after clicking the banner below and redeem NoLuckNeeded.com's exclusive 50 free spins (no deposit required) bonus code "NOL50" in the casino cashier. Good luck! $180 Maximum Cashout rule applies; 60x Free Spin Wins wagering requirement. Expiration date unknown. Players are usually not allowed to claim 2 free bonuses in a row. The codes seem to be working for new & existing players. This offer is valid for Jackpot Capital customers who have completed a deposit in October 2017. Expiration Date: October 31st, 2017. Standard Free Bonus Terms apply. Expiration Date: December 31st, 2017 $200 Maximum Cashout; 60x Free Spin Wins wagering requirement. 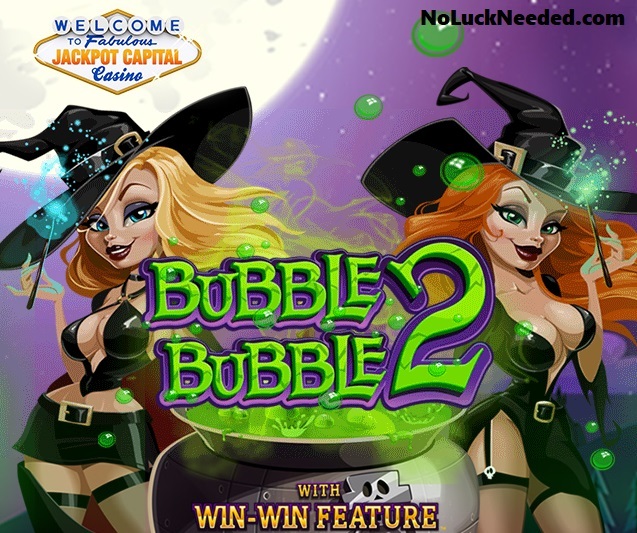 Claim Your 30 Free Spins on Bubble Bubble 2 at Jackpot Capital Casino Today! Coupon ***** was redeemed. Congratulations! If you received the 30 spins promotion via email please paste the message here. A member gave me the codes, so I don't know the story behind them. I actually made playthrough and got over $50 with one of the codes. Fun times! Please post here if the codes redeem as expired. Thanks! Are these codes still working? Was able to play enough to get $1 in comp points. chillymellow, Thanks so much for the information! WTG chillymellow, have not played JPC in years. Used to be my favorite place to play.